What happened in Vegas... — MacKay & Company, Inc.
MacKay & Company and FinditParts are combining their respective market expertise to more closely examine the online parts purchasing patterns of medium and heavy duty fleets. 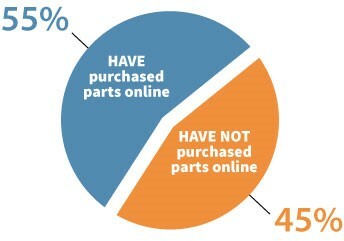 55% of fleets in our sample have purchased a Class 6-8 truck or trailer part ONLINE. 45% of those who don’t purchase parts online indicate deterring factors such as lengthy delivery times, desire to speak with a salesperson, the need to know a part number. Of the 45% who DO NOT currently purchase parts online, nearly half of these fleets plan on making online parts purchases in the future. MacKay & Company has specialized in marketing research and consulting for the commercial truck, construction and agricultural equipment industries since 1968. The company’s primary focus has been delivering market analysis of components, distribution channels and market trends for both original equipment and the aftermarket. Cornerstone Growth Advisors is a management consulting firm whose focus is growth strategies, profit enhancement, leadership and board development. With MacKay’s joint venture relationships in England, France, Germany, Brazil and Mexico, and Cornerstone’s business experience in each of these markets and more, the businesses say this new affiliation provides an even broader global capability for both companies. “We are excited about the opportunity to deliver an even broader portfolio of capabilities to our clients,” says John Blodgett, Vice President of Sales and Marketing at MacKay & Company.